A crowd is gathered before a man at a lectern. In the background a sign says: Employee Meeting. Man: To cut costs, we must buy from the lowest bidder. No exceptions. The same man is now seen sitting at a desk. On the desk a sign says: CEO. A woman carrying a big document walks towards the man. Woman: External salary consultants sent their report, sir. Management is incompetent and pay should be cut by 90%. 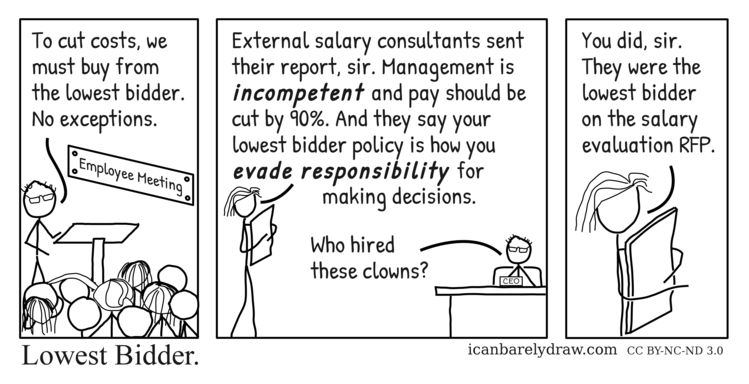 And they say your lowest bidder policy is how you evade responsibility for making decisions. Man: Who hired these clowns? Woman: You did, sir. They were the lowest bidder on the salary evaluation RFP.